RAPID CITY, S.D. 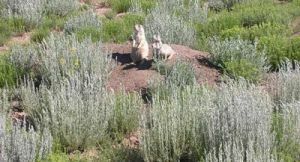 - SD Stockgrowers Association would like to remind producers and landowners that it is the responsible of each landowner to manage prairie dogs in such a way that does not allow the rodents to move onto neighboring property. This includes private landowners and government agencies. "The prairie dogs have been moving a lot this year and we've seen dog towns expanding across a lot of the drought areas this year. It's really damaging a lot of grass lands across the state," said Stockgrowers President Bill Kluck. "We want to remind landowners to take prairie dog control seriously and also help to hold Forest Service and BLM accountable for managing their lands by reporting encroachment." Prairie dogs are considered a pest in South Dakota and prairie dog towns can severely decrease grass production and land values as the rodents dig up large areas of prairie and over population can lead to spread of diseases such as plague. "We know managing prairie dogs add extra work in a year when the drought already has many of our ranch families stretched to the max, but it's also a hardship to the neighboring landowner when someone isn't taking care of prairie dog problems," said Kluck. "The deadline for reporting is coming up, and we encourage landowners to make sure they're taking care of any problems on their own land." If landowners have prairie dogs encroaching from neighboring private lands, they can file a formal complaint with the landowner and also send it to the SD Department of Agriculture or their County Weed and Pest Board. The form can be found at http://sdda.sd.gov/legacydocs/Ag_Services/forms/pdog%20complaint%20form.pdf. These complaints can be filed at any time of the year.